BOTHELL, WA, Jan. 03, 2019 (GLOBE NEWSWIRE) -- Cocrystal Pharma, Inc. (NASDAQ: COCP), (“Cocrystal” or the “Company”), a clinical stage biotechnology company discovering and developing novel antiviral therapeutics that target the replication machinery of influenza viruses, hepatitis C viruses and noroviruses, announced today that it has entered into an exclusive license and collaboration agreement with Merck to discover and develop certain proprietary influenza A/B antiviral agents. Under the terms of the agreement, Merck will fund research and development for the program, including clinical development, and will be responsible for worldwide commercialization of any products derived from the collaboration. Cocrystal will be paid an undisclosed upfront sum and is eligible to receive payments related to designated development, regulatory and sales milestones with the potential to earn up to $156 million, as well as undisclosed royalties on product sales. 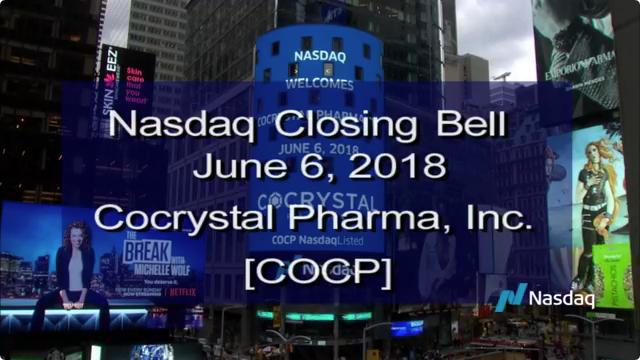 Cocrystal Pharma, Inc. is a clinical stage biotechnology company discovering and developing novel antiviral therapeutics that target the replication machinery of influenza viruses, hepatitis C viruses, and noroviruses. Cocrystal employs unique structure-based technologies and Nobel Prize winning expertise to create first- and best-in-class antiviral drugs. Novel inhibitors effective against influenza strains A and B have been identified and are in the preclinical stage. Several of these have potencies approaching single digit nanomolar. The Company’s lead candidate CC- 42344 for influenza strain A is effective in animal models against both the pandemic and seasonal strains of influenza A. We continue to identify and develop non-nucleoside polymerase inhibitors for Norovirus infections using the Company’s proprietary structure-based drug design technology platform. For further information about Cocrystal, please visit www.cocrystalpharma.com. This press release contains forward-looking statements within the meaning of the Private Securities Litigation Reform Act of 1995, including our expectations regarding the timing for achievement of certain research and clinical development milestones related to the licensing agreement with Merck as well as royalties on any product sales. The words "believe," "may," "estimate," "continue," "anticipate," "intend," "should," "plan," "could," "target," "potential," "is likely," "will," "expect" and similar expressions, as they relate to us, are intended to identify forward-looking statements. We have based these forward-looking statements largely on our current expectations and projections about future events. Some or all of the events anticipated by these forward-looking statements may not occur. Important factors that could cause actual results to differ from those in the forward-looking statements include the availability of products manufactured by third parties, the results of planned research and, if successful, clinical trials, and receipt of regulatory approvals. Further information on our risk factors is contained in our filings with the SEC, including our Quarterly Report on Form 10-Q for the quarter ended September 30, 2018, the Prospectus Supplement dated July 19, 2018, and our Annual Report on Form 10-K for the year ended December 31, 2017. Any forward-looking statement made by us herein speaks only as of the date on which it is made. Factors or events that could cause our actual results to differ may emerge from time to time, and it is not possible for us to predict all of them. We undertake no obligation to publicly update any forward-looking statement, whether as a result of new information, future developments or otherwise, except as may be required by law.